Why Teach English as a Foreign Language. If you love teaching or have been searching for your niche, you may have wondered at some point, “Why teach English as a foreign language?” If so, you should know that there are many different benefits and reasons for teaching English as a foreign language (TEFL). 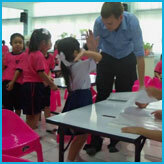 With EFL, you could be teaching students of all ages, from little children to the elderly. It offers all kinds of new experiences just waiting for you. In addition to all of these benefits, you also get the joy of general life experience all over the world. Coursework and certification can be completed quickly. Intentions as to why teach English as a foreign language may be very personal, but these are a few that people usually consider. One important aspect to note is that getting trained for TEFL is a lot simpler than many people think. Although there may be a certain amount of in-class training and practice teaching, most courses have some sort of online availability. This means you can often get certified by completing a course on your own timeline. It is convenient, and most courses can be completed between one and two years. For people who might be considering a career switch, this is particularly suitable. Why teach English as a foreign language? Only you can decide what sort of benefits and reasons make a career in TEFL a good option. If you are the type of person looking for a job that helps people while allowing you to travel and see the world, then TEFL might just be for you. It is easy to switch over and start your training right now with the right online TEFL course. Start searching for the best course to get the training you need for an exciting and rewarding career today.